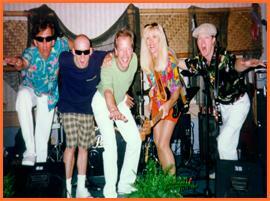 Members of 8 Bands In One are Bill Horn, Candy Chase, Michael J. Dohoney, and Dave Fraser. Three of the original members are Texans and hail from “Cowtown”. Dave Fraser is the honorary Texan and is originally from Sacramento, California. Born and raised on the West Side of Ft. Worth, Bill Horn was recently awarded “The Lead Guitar Player of the Year” by the California Country Music Association. He graduated from the same high school that John Denver and Roger Miller attended, Arlington Heights High School, and his college years were spent at North Texas State University and the University of Texas at Austin. As a member of Cahoots, a popular local Fort Worth country rock band, he won the prestigious Buddy Magazine’s “Most Promising New Comer” award in 1977. Cahoots also helped initiate the renovation of Cowtown’s old North Side by bringing westside patrons to their gigs such as the Longhorn Bar, The White Elephant, and appearances at the Northside Coliseum Rodeo. Also noteworthy is their performances at the Roundup Inn for the Fort Worth Stock Show and Rodeo dance several years running back in the mid seventies. In 1980, Cahoots moved to L.A. and played local clubs while they recorded a never released album in their home built Malibu studio. Candy Chase was born and raised in Cowtown, attended North Side High School, North Texas State University, and then went on the road with an infamous all girl band, “The Kandy Kanes”. Finding her way to California, she has become a top-notch session bass player, vocalist, and songwriter. Michael J. Dohoney was born and raised in Cleburne, Texas. When he turned professional at age 17, his musical travels led him to a new home in Ft. Worth. Being one of the only singing drummers in town, he was quite in demand, which helped him develop his soulful style. From there, his career has taken him to Southern California where he enjoys a successful career doing recording sessions, and writing songs. Dave Fraser developed his virtuoso keyboard and harmonica playing by the age of 18. He played in local bands around Sacramento until moving to LA, when he became a bandleader for Disneyland’s Tomorrowland Terrace show band. The early formation of the band began by a chance meeting in L.A. by Candy and Michael J. . But to set the stage, ten to fifteen years earlier back in Ft. Worth, Michael J. had heard of this gifted left-handed R&B/Pop singer/bass player named Candy but had never actually met. Then many years later out in California, a mutual friend had connected them for a local gig and after working a few times together, and finding themselves in need of a guitar player, Michael J. suggested Bill Horn. The first time all three of them played together Bill recalls “It just seemed to click musically… and on a friendship level too. We had all these things in common like Ft. Worth, Country Music and California.” An interesting sideline to this is that Bill and Candy found out they shared the same last name, Horn (Candy’s maiden name). At this point in time, these future band mates were involved in many other working acts and original projects. 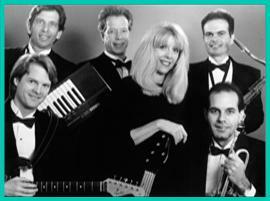 While Michael J. was committed to other projects, Bill and Candy started an original band and made their debut back in Texas as “The Horns”. Then later on it became evident that Michael J.’s expertise on vocals and drums would complete a powerful and versatile trio. Soon thereafter, they began recording their first demos. A few years later keyboard player/Disney bandleader Dave Fraser offered the band the perfect fourth piece with his fiery keyboard and harmonica playing. Within two months, they were offered the ‘House Band’ gig at the prestigious “Neon Cactus” within the Disneyland Hotel. Entertaining international crowds five nights a week for three years was the perfect venue for a young band to solidify and hone their musical and entertainment skills. This opportunity offered the perfect foundation for their band to launch a recording career. In October 1998, Fort Worth West released their debut CD on DJM Records. Their music was so well received by radio listeners in Canada, Australia and Europe, that by July 2000, they were awarded the 1999 European Country Music Association’s “BAND OF THE YEAR”. Great reviews are popping up on the Internet and many Country Music tabloids. Even in the prestigious WeatherBureau insert of BILLBOARD MAGAZINE (March 13, 1999) they have gained recognition. Look for their CD in record stores across the US and at music websites like: Amazon.com, CDNow.com or DJMREC.com. or on this website.